By Dan Horowitz--On Sunday, December 8, Johannesburg’s Jewish community paid tribute to Nelson Mandela, the man South African Jews referred to as their own “Joseph”, thanks to his lifelong commitment to ending apartheid, and who, despite almost three decades of imprisonment, passionately – and with unyielding optimism - led his nation to better times. “Madiba”, as he was affectionately known, peacefully passed away on Thursday, November 5 at the age of 95. “In Nelson Mandela, we found our own Joseph,” said Chief Rabbi Warren Goldstein during Sunday’s Jewish prayer and memorial service held at Oxford Synagogue in Riviera, just a stone’s throw from where the statesman passed away. Rabbi Goldstein went on to tell the packed synagogue that most of South Africa’s 70,000 Jews immigrated from Eastern Europe to begin new lives free of anti-Semitism, making the freedom of the new “rainbow nation” even more vital to them. “These are blessings that our history as Jews tells us to never take for granted,” Rabbi Goldstein told the crowd. 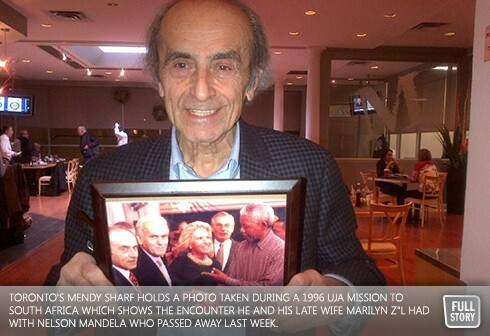 While tributes to the late South African leader continue around the globe, Mendy Sharf, a leader of Toronto’s Jewish community through UJA Federation, has his own vivid memories of the time he met Nelson Mandela. “We were on a special UJA International Leadership Retreat Mission to Capetown, South Africa in 1996 where Mr. Mandela was being honoured by Shimon Peres, and I remember how impressive - and what a true statesman this man truly was,” says Sharf, proudly holding a photo showing he and his late wife Marilyn chatting with the South African leader. “He clearly respected the Jewish people, and was appreciative of our contributions to society.” The tribute ceremony, held in a Capetown sports stadium, attracted some 5,000 participants, including members of South Africa’s Jewish community. “I remember being struck by how tall the man was, much taller than he is perceived in photos or on television, and I remember that when he spoke, people listened. He had that quality that all true statesmen have. And, even though it was almost 18 years ago, I still remember his words: ‘Let’s talk about today and what we can do for tomorrow; and let us forget about the past.’” Then, after he had finished his address, and without warning, Mandela left the stage and made a beeline for Sharf and Marilyn z’l.